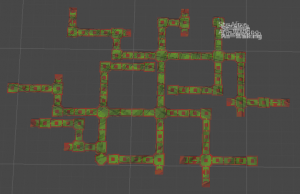 As I previously discussed, my current dungeon layout generation logic is hard-coded. However, I really need to iterate on my dungeon layouts and design. In fact, I need to see dozens if not hundreds of examples before I can say any of it is working. And I cannot keep changing the code every time. What I have is proof of concept and I could go two ways — keep writing code and hard-code all the logic or have it modular following external steps. I’m going with the second (and I really hope it won’t take too much overhead time). First of all I want a dungeon layout definition asset that I can modify quickly in the editor and swap out as needed. This is also something I need in order to have different layouts based on level themes or other requirements. 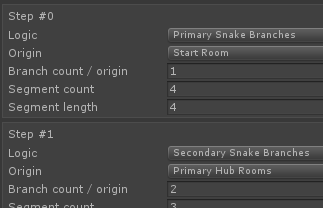 In fact, this being an asset, I can modify it at runtime and regenerate the dungeon and it will use the new parameters. And at this point I’ve parametrized everything there is to parametrize that I previously anticipated I would want to change. From now on, it’s new features or modification of existing ones. 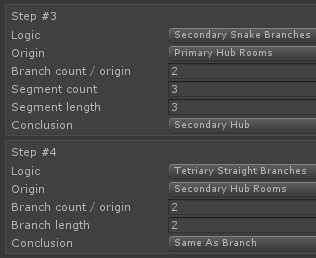 The problem here is when I expect the branch to end with a certain conclusion, such a specific hub room (which, practically speaking, might be important boss or loot rooms). And if I end up with all branches broken, then the rest of the dungeon will not even generate. 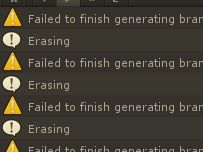 So there are two options here: either let the branch re-generate and try again or make it know how to truncate early. In fact, I likely need both — first retry, then truncate. I will make retry logic for now. 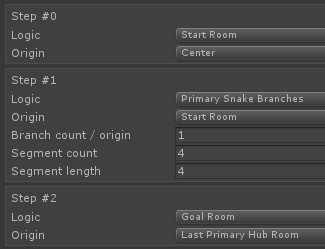 For that, I need to keep track of rooms I place during branch generation. And if it fails, I need to rollback all the changes I made. 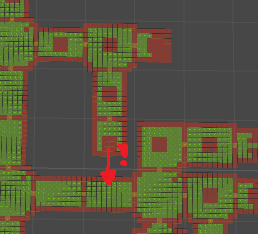 Undo/retry is generally a bit tricky, but thankfully, I am generating the first dungeon part with pure logic nodes, so it’s fairly easy to add/remove and connect/disconnect them. There are still many improvements to make, big and small. But the big modularity part of it is done. From here I can make different dungeon layouts through the use of assets for different themes, difficulties, etc. I will cover further individual improvements and additions in different posts. I’ll have to do a whole another pass on this later.